The museum is currently closed for major renovations. Please check back at a later date for our reopening time. But dont expect to see the usual menagerie of mint-condition Thunderbirds, Stutz-Bearcats and Sting Rays; Mr. Miller doesnt believe that the vehicles themselves reveal as much about us as do the toys, publications and other accessories that are associated with the auto industry. In fact, there are no cars on display at the Museum of Automobile History in downtown Syracuse, which houses one of the largest collections of automotive memorabilia and art. The building at 321 North Clinton Street, just off Clinton Square, is adorned with 20 authentic full-color billboards -- each 20 feet wide and 10 feet high, advertising American marques of 1940s and 1950s -- that set the tone for the idiosyncratic, but mesmerising, show inside. Every inch of the 12,OOO-square-foot museum is filled with items like oil paintings, styling models and sketches and rare advertising pieces, including a complete set of Burma-Shave rhyming road signs. 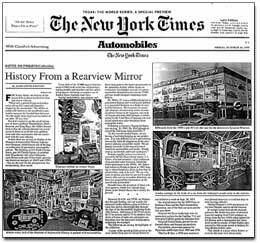 Racing memorabilia, auto gadgets and showroom posters also figure prominently in the sprawling display, whose scope encompasses a newspaper account of a proto-automobile demonstration from the 1770s and late-model designer renderings from Detroit. Mr. Miller, 43, says a childhood interest in automotive history and world travel led him to a successful business as a dealer in automobile literature. His museum, for example, displays an interesting series of correspondence between the Japanese auto maker Toyota and Jeny McCullough, a former stylist for the Ford Motor Company who collected automotive sales brochures from around the world. Perhaps equally curious is a letter received by the late Duesenberg expert, J. L. Elbert, who had amassed a large collection of automobile sales literature, which Mr. Miller purchased in the 1970s. Mr. Elbert had written to Honda in Japan in 1962, hoping to obtain brochures about its first line of automobiles, only to be told: We are very sorry to advise you that we are not in a position to offer our car to market, therefore, we have not prepared the information on the new Honda automobile. Decades later, the prospects of these one-time upstarts, which now operate huge plants in the United States, have clearly improved. A copy of the speeding ticket given to the actor James Dean just two hours be fore he was killed in a crash on Sept. 30, 1955. An original poster for the 1895 Paris-to-Bordeaux Race and the Paris Automobile Exposition, one of the first car races and the first auto show. Original Art Deco renderings done by automotive stylists for the Cadillac V 16 and Sunealist Cadillac prints by Salvador Dali. Original United States patents for the Daimler-Benz and Duryea automobiles. Psychedelic showroom posters for Plymouths and Dodges from 1969 and 1970. The Car-B-Que, a 1958 auto accessory that allowed motorists to cook hot dogs in their moving vehicles. Walter Chrysiers 1924 registration for the tirst Chrysler and his driver's license. This clearly is a place where history arrives by the crate load almost daily. please contact us at 315-478-2277 or info@autolit.com.